By Brandon Plunkett. Originally posted on Linkedin. 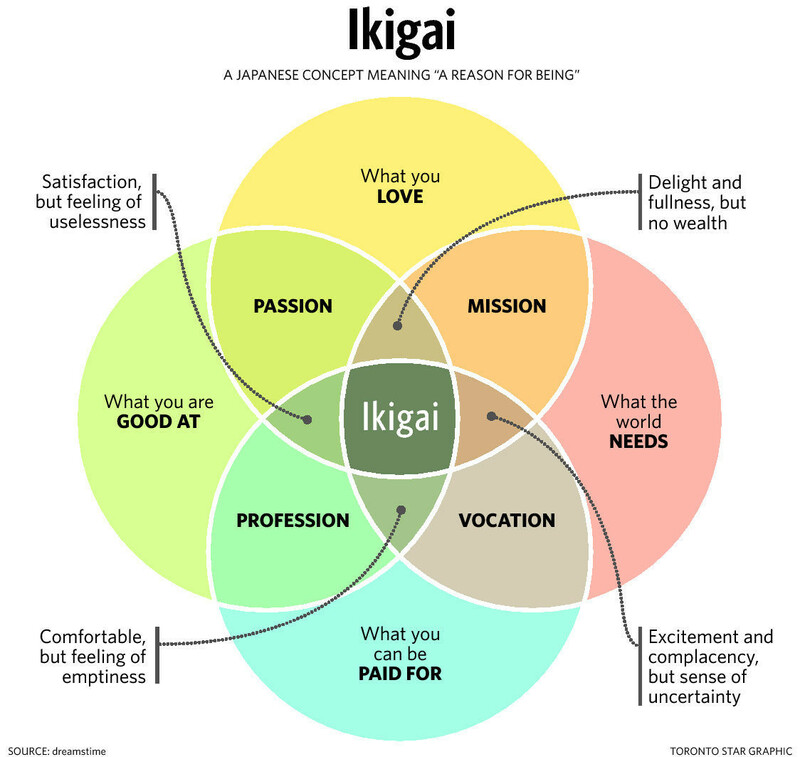 As I sat here pondering the significance of this infographic and how it represents exactly how I am trying to steer my own ship right into that fulfilling “Ikigai” sweet spot, I wondered why we English-speakers have not created an equivalent word. ‘Fulfillment’ is a good word, but I think we can do better in capturing the essence of living a life full of purpose and meaning. I also understand there is a Japanese word that means “overwork death” (Karōshi) and I don’t believe that “Ikigai” is only possible through overwork/excessive work. I think I (as well as others) have lived cluttered, somewhat chaotic lives full of busywork and distractions. Through introspection and really taking a good hard look at what we want out of life, I believe that we can achieve the “Ikigai” state through goal setting, decluttering, focused and consistent efforts, and an unwillingness to settle for less than our fullest for every moment we move through this earth. We have the greatest abundance of knowledge and resources available at our fingertips in the history of mankind and the only thing standing in our way is fear. Fear that we’re not good enough; fear that we’re imposters; fear that we don’t have it in us to succeed. Bullsh*t.
Every one of us has it within us to thrive and lead the life of meaning that we desire. It all starts with action – large or small. Vince Lombardi said that the “Man on top of the mountain did not fall there”, which I love. The man (or woman) also didn’t necessarily get there by leaps and bounds either. He/she got there by starting with a single step and then putting one foot in front of the other until cresting the apex. Taking the first steps toward the mountaintop is the most exciting, invigorating, and fulfilling thing I have ever done in my life. The journey is amazing every step of the way and I can’t wait to see what the view looks like! If you feel compelled to share this with others, I greatly appreciate it. If you don’t, I appreciate that you took the time to read it. In either case, I wish you all the best in your journey in 2018!